It is with much sadness that we report the passing of IPA Director, Ed Szela. Ed had been a director since 1999 and one of the co-organizers of the annual IPA Hall of Fame benefit dance in Ludlow, Massachusetts. We extend our deepest sympathies the entire Szela family. May he rest in peace. Note: On January 19th, 2018 Jeanne Szela also passed. Ed and Jeanne were definitely and match made in heaven and will spend eternity together. Sympathies and condolences to the families of both Jeanne and Ed. May they both rest in peace. Ed Szela was elected IPA Director from Massachusetts in August 1999. He was born in Thompsonville, Connecticut, the son of Polish immigrants. 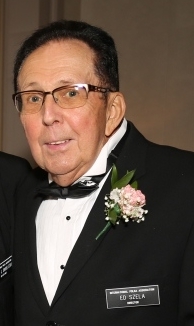 His parents were actively involved in the Polish community, volunteering their services at local polka dances where Eddie developed his love of polka music and learned to speak Polish fluently at an early age. Eddie married his wife of 48 years, Jeanne, on October 23, 1965.
picnics, and polka cruises. Eddie & Jeanne reside in Longmeadow Massachusetts where they host an annual Christmas Party at “Club Szela”- Where the Party Never Ends! Ed has always been dedicated to keeping polka music alive, not only by supporting various clubs and polka bands by attending their dances, but also by being an active member of the IPA and other polka organizations. He has for may years, along with Freddy Kendzierski, run a benefit for the IPA Hall of Fame at the Ludlow PACC with several thousand dollars of proceeds donated to the Hall of Fame Fund. He is a dedicated board member of the Ludlow PACC and holds the position of Dance Committee Chairman donating his time and efforts to bringing many popular polka bands from near and far to entertain the polka fans. He also has organized many bus trips to various polka weekends and Polka Festivals. Ed is proud to have been honored by the Ludlow PACC with the Citizen of the Year Award for 2010, and by the IPA with the Joe Jozwiak Award for 2012.